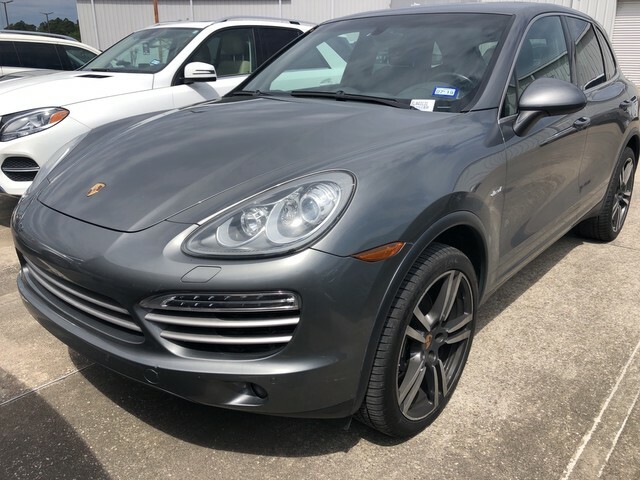 We are excited to offer this 2014 Porsche Cayenne. CARFAX BuyBack Guarantee is reassurance that any major issues with this vehicle will show on CARFAX report. The Porsche Cayenne is the benchmark all other SUVs strive to meet. With exceptional power, towing and handling, this SUV can handle anything thrown at it. The Porsche Cayenne Diesel's pristine good looks were combined with the Porsche high standard of excellence in order to make this a unique find. When driving an all wheel drive vehicle, such as this Porsche Cayenne Diesel, superior acceleration, traction, and control come standard. More information about the 2014 Porsche Cayenne: The Porsche Cayenne represents the ultimate in SUV performance and capability. All are agile, quick, able handlers that rival many sports cars, but also offer the versatility of being able tow between 6,000 and 7,700 pounds. With seven trim levels available--Base, Diesel, S, GTS, Turbo, Turbo S and S Hybrid--there's a Cayenne to suit all enthusiasts in the range from mild to wild. With a starting price of just $49,600, getting into a Cayenne rather than a BMW or Mercedes SUV is a real option. Interesting features of this model are high people carrying and cargo capacity, Several powerful engine options, luxurious interiors, and excellent handling We look forward to seeing you soon! Please call us for more information.